Are you a budget-minded buyer willing to spend a few hours with an Allen wrench constructing your desk or bed frame? Then IKEA is a good place to shop. Sure, the quality won't be anywhere near that of Ethan Allen (ETH). But not everyone can afford to drop $3,000 on a new leather sofa, as nice as it may be. Let's assume you don't want cheap furniture, but you can't afford top-of-the-line stuff, either. Don't fret: For those shopping for something that falls in between those two extremes, there's no need to pay sticker price -- especially when you know the insider tips and tricks. These tips come from conversations with veteran furniture salespeople, and would-be buyers who follow them might be able to save themselves hundreds of dollars. 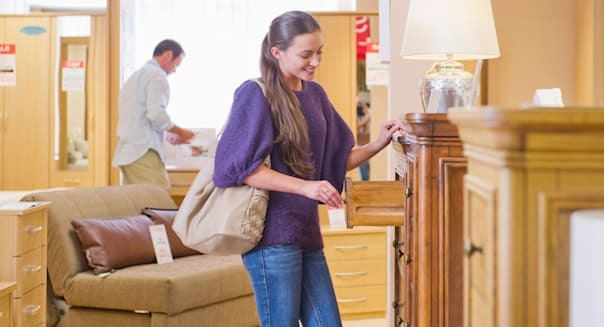 Even if you don't see a "for sale" tag, floor samples -- the individual pieces of furniture sitting out on the showroom floor -- are often sold at a steep discount to the smart customers who ask for them. Admittedly, those discounts are sometimes warranted, as the furniture left on display can suffer from some slight wear and tear. But if the object looks to be in reasonably good shape, buyers should ask their salesperson if the floor sample is available. When it is, buyers can save themselves 30 percent or more. Timing is everything, since it may be a while (or never) before a store swaps out floor samples of their newer designs or staple pieces that the store always has on hand. Getting your furniture delivered costs money. But if you have access to a truck, a strong set of hands, and a spare afternoon, you could save yourself $100 or more simply by picking up your purchase yourself. Even when delivery is offered "for free," the cost has likely already been factored into the price of the item. So, if you're offered free delivery when you buy your furniture, tell the salesperson that you're willing to pick it up if he or she could shave some money off the final tab. If you pay attention to their ads, most furniture stores seem to be running a sale almost every week. These companies can offer such great "deals" because their furniture is often marked up significantly: Industry analysts put the average around 40 percent. %VIRTUAL-article-sponsoredlinks%If you happen to go shopping on one of those rare weekends without a sale, be ready to negotiate with your salesperson. If the item in question isn't already marked down, the price can almost always be negotiated. Experts say that getting 20 percent knocked off the top shouldn't be difficult. Granted, this won't apply to closeout items dumped in the clearance section. But for most pieces of furniture, never willingly pay the sticker price. When buying furniture, expect to have your salesperson pitch you an extended warranty. Those warranties can sometimes be worth the asking price, depending on the cost and your circumstances. But furniture shoppers should be skeptical of any niche offerings. For example, buyers of new sofas are often offered extended "fabric protection" policies. The damage these policies claim to cover is often already accounted for under the normal warranty or the store's extended warranty. Buying fabric protection in addition to an extended warranty may be nothing more than a total waste of money. At any rate, take the time to carefully read over any warranty policies offered -- don't just take the salesperson's word for it. Of course, there are many other ways to save on furniture -- heading to a cheaper store, buying used, or even building your own. But if those options aren't on the table, and you're just looking to save a few bucks at your local furniture store, keep these tips in mind. Motley Fool contributing writer Sam Mattera has no position in any stocks mentioned. The Motley Fool has no position in any of the stocks mentioned. Try any of our newsletter services free for 30 days.